Hope will be closed for brunch this Saturday in order for prospective students and their families to get a taste of what the food is like at the University of Rhode Island. This will be the case for all three welcome days this semester. 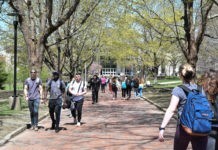 Students who live on campus and who rely on their meal plans will not have to go without eating, according to Director of Dining Services Steven Mello. The Rams Den will be open from 10 a.m. to 3 p.m. this Saturday, April 8 and 22. For each of these dates, Mello said the University is anticipating more than 3,000 visitors. For this reason, both Hope and Butterfield will be open. Prospective students and their parents can expect chicken parmesan and caesar salad instead of normal brunch options like omelets or French toast sticks. “In the Office of Admissions we wanted to give students a more authentic opportunity to try the food in the dining hall,” said Director of Visit Experiences Erin Earle. Part of the reason behind providing visitors with the dining hall experience is due to the fact that many other peer institutions and competitors of URI are already doing this, according to Earle. Many visitors have also been asking the opportunity to see what the dining hall food is like. 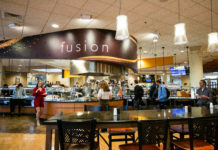 In order to make up for the inconvenience to enrolled students with meal plans, Mello said that he will provide all students with a standard meal plan or greater with an extra grab and go swipe for the day. Students can also eat at Hope starting at 2 p.m. The menu at Ram’s Den will include dining hall favorites, like mozzarella sticks and chicken nuggets, along with actual brunch options, according to Mello. Although there has not been much advertising to notify students of this change, some of the students that The Good 5 Cent Cigar spoke to did not seemed bothered by the news. Similarly, sophomore Gibiany Aives said he normally goes home every weekend, so the changes won’t affect him.